" The featured artifacts are impressive, but show different characteristics from those that I am finding. The Virginia and NC finds appear to be of much more age and show an art of much greater sophistication than the art shown in the article." the art work from the article is genuine . It is also perfectly clear . That is not the case with your examples . "Yes, it is my opinion that some of the Calico artifacts have worked in art that is similar to the Virginia and NC finds. This also applies to some of the Topper artifacts purported to be 50,000 YBP. I am not alone in the opinion about some of the Topper artifacts having art incorporated into them." No expert in rock art would agree with your assessment about rock art from Calico or Topper ,or your own "finds " for that matter .
" I have found the artists involved with the Virginia and NC artifacts demonstrate the highest artistic skills that I have witnessed." No expert in rock art would agree that there was any "art " present , and why should your belief have any credibility ? "As with the slowly gained respect for artists of various modern schools of art, maybe it will take time and learned respect for folks to appreciate, see, and try to understand unfamiliar expressive creations from the deep past." The respect was there from the start, at least from some critics , more to the point nobody argued that the "art" was natural or a case of pareidolia . Homo Erectus appear to have been major explorer types whose advanced ways may have been overly discounted by many who have studied them in past times. HE is responsible for the production of hand axes in Africa hundreds of thousands of years ago which incorporate art into the tools. This begs some reassessment of the supposed 40,000 year ago flourishing of human artistic expression. Perhaps they are unsung heroes of our ancestry. I hope you come across that documentary. I am continually challenged to convey the nature of the VA/NC artifacts to those unfamiliar with the assemblage (almost everyone). Clarity of subject matter would be most helpful, but is it a show stopper when an artistic or worked piece isn't perfectly clear to the observer? My contention is that it simply requires more effort in the observation and image recording process. Fortunately, the agreement by experts on the existence of these artifacts, though it would be nice, is not a requirement for their authenticity. That these pieces may not fit into the slots provided by the status quo in no way diminishes their inherent nature and their potential to further understandings. The art of Circumspice's examples is easy to see, therefore believe. Two of the plaques, however, were not clear to casual observation and required tracing to show the subject matter. If these had not been found in close context to the other easily identifiable art works, would they have been appreciated? What if all the pieces had been that difficult to see and the context was not clear? That is the boat I am in. There are countless examples of rock art that is not easy to see due to degradation of the markings poor lighting of images etc . Often it requires returning to the surfaces at various times of day /season or using techniques like sidelighting under cover etc. This is made clear in by the those recording these examples . Scroll down to the 30 th pic then look at 29 they are of the same surface , in one there is nothing apparent but with the addition of water and low light the motifs become apparent . That is not the case with your examples . You claim that the markings are evident in the images ,but they are only evident to you . Last edited by Tiompan on Thu Apr 06, 2017 2:55 pm, edited 1 time in total. Thanks for the link. I find it very useful to view all my finds in varying conditions: full overhead sun, shade, twilight, wet, all angles and attitudes, and the late sidelight of the sun on my porch after work. 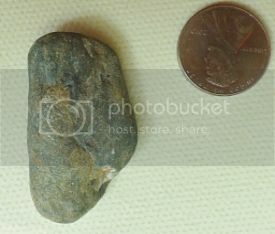 As I have stated many times in this thread, the best way to see these subject matters and motifs is to personally handle the stones. On the other hand, many worked creations on these pieces have only been evident to me after I have made an image and then analyzed that. The difference is that none of your finds have any evidence of any markings , from any period . The link was of only one example of how the change of lighting can help highlight marking that are almost invisible in other lighting conditions . Ultimately the markings were seen . I wouldn't consider showing the image of the surface with no apparent markings although I was aware there were there ,and other experienced researchers would have appreciated the possibility of their presence if the image was shown with an explanation ,but it is only interesting in relation to a before and after comparison . As been stated many times in relation to your images "The anthropogenic involvement has not been verified , and even if it were , it has not been not dated . 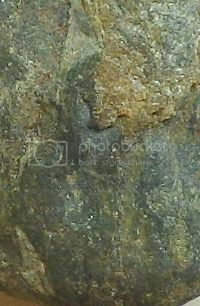 The above micro image shows a lass facing left. She appears to have a mole near the left corner of her mouth and another on her upper neck under the ear lobe. 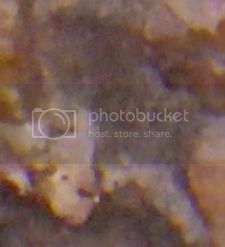 I found this through image analysis and though I could see an area of interest on the artifact, it was not until I took the photograph and zoomed in a bit that this art work was apparent. This is one of many thousands of such human worked art in very small scale all over the artifacts of this assemblage. The apparent facial structure shows possible ancient hominid characteristics. The human representations in this assemblage detail individual characteristics and appearance. In the above image there even seems to be some adornment or curl hanging from her hair as her ear lobe is not positioned for the hanging piece to be an earring. These art works show a variety of hair styles, clothing and accessories, jewelry, and facial expressions. People are only one element of a large body of subject matter in the art. as has been said many times , there is nothing to be seen in the in images you post here . Even if there were , they could date from any period . Why do you waste time posting them here when you could have taken them to be viewed by any number of specialists who will disabuse you of your pareidolic fantasies , and belief in some great age for the non -existent motifs ? Your categorical denials of the existence of motifs on the subject artifacts could be your lack of familiarity with this perhaps heretofore unknown assemblage rather than an off the cuff diagnosis of some condition you conveniently think I have, with all due respect. Am I to jet off seeking the analysis of specialists with some outlandish budget I might have at my disposal? Above, the lowermost image is that of an artifact in the attitude showing micro imagery in its upright composition. The upper right image shows a bearded man facing right perhaps riding a domesticated animal. He wears a conical hat and sports an amply muscled right arm positioned to hold possible reins. The upper left image is simply the upper torso view of this man in greater magnification. There are other micro art features on this artifact I will not bother to mention with the skepticism factor being what it is. I have a new group of artifacts yet to be photographed that I hope will yield clear indications of worked art if for no other reason than getting beyond the "just say no" stage of criticism and into navigable water. "Your categorical denials of the existence of motifs on the subject artifacts could be your lack of familiarity with this perhaps heretofore unknown assemblage "
How could anyone be familiar with an "heretofore unknown assemblage" ? I am, however familiar with outlandish claims with no supporting evidence ,and your numerous images are a perfect example . More to the point ,there is nothing to be seen in those images that you claim to have content .
" off the cuff diagnosis of some condition you conveniently think I have "
Pareidolia is not a condition , it partly explains your belief ,although I think there is a large element of wishful thinking too . It is not an off the cuff diagnosis it's an explanation . "Am I to jet off seeking the analysis of specialists with some outlandish budget I might have at my disposal? " No need to jet off anywhere , there must be some local specialists within a bus drive and they will not charge . Why have you avoided doing this ? Even if there were some genuine images created by 17th C - 20th C "artists ", it would be of some interest . But that is not the case any more than the outlandish belief that the non existent images are actually "ancient " . You seem to use the horse plaques as an example of how your rocks are being overlooked or misunderstood... Why? The subject matter of the horse plaques was entirely evident with minimal enhancements. That is NOT the case with your rocks. Once the outlines of the images on the horse plaques were made plain it was easy to see what was depicted on them. You have done the same with your rocks (repeatedly) & we still can't see what you claim to see. by Homo erectus... Really? And you wonder why no-one takes you seriously??? With recent news from the west coast concerning ancient hominids and the new technique for DNA recovery from the soil, I suspect well funded folks will eventually come up with solid evidence for some new ideas about how long people have been in the Americas. As to HE using lenses, I believe my speculation about the use of lenses by the former occupants of the mountain site did not specifically state this hominid was responsible. My idea is that whoever created these works must have needed lenses to work in such small scale. I do, however, think that HE could have easily been in the progression of occupancy of the mountain site and elsewhere in America. Now the call is out to re investigate promising sites for evidence of very ancient populations. Gosh, maybe the subject can even be discussed without outright rejection and purposeful ignorance inherent in previous dismissals. The evidence has been out there for a long time already. It will be interesting to see the strategies of those wishing to now be on the wagon if more headway is made to confirm these theories. Gosh, maybe the subject can even be discussed without outright rejection and purposeful ignorance inherent in previous dismissals. When was the "subject " rejected outright without consideration of evidence ? When was purposeful ignorance inherent in previous dismissals ? If you are talking about your other claims , that certainly was never the case . How could anyone be familiar with a "heretofore unknown assemblage?" My point, exactly. I simply wish for open minded approaches to what may be unknown. Maybe my "outlandish claims" are not as far out there as before with recent news from California. I have sought and received the services of a specialist, Jack Hranicky, but that seems to mean little to some though Jack has identified "provable" Pleistocene artifacts in the assemblage. Pareidolia is the pet possible explanation used to refute what may not be palpable to some. "Wishful thinking"...........I am beginning to think these artifacts may be a curse rather than some aching fantasy you perceive I have. In any event, I am trying to understand what is in front of me and will continue to do so. Thanks again for your feedback. P.S. No "evidence" I have brought forward has been accepted in any way. Purposeful ignorance has many forms, but is always a willful act of cogitation and does not have anything to do with true ignorance. It is a mind set. "How could anyone be familiar with a "heretofore unknown assemblage?" My point, exactly." No it wasn't . Your point was entirely different .You had said " "Your categorical denials of the existence of motifs on the subject artifacts could be your lack of familiarity with this perhaps heretofore unknown assemblage "
Which was suggesting that the reason I have pointed out that there are no motifs was due to lack of familiarity . But I was familiar with the images which you had presented as having motifs . My point was that being familiar with something unknown is an oxymoron . Your claims are outlandish based on the evidence not on circumstances elsewhere . Has Jack Hranicky made any comments on your claims ? If he believes that there are any motifs on the same stuff that you claim you can see in the images you post here, then he is deluded as you are . If he thinks that these non-existent images are also prehistoric then he doubly deluded . If you believe the images are real than it is a case of pareidolia , it's very common . 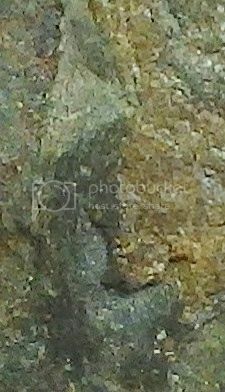 The evidence you have presented is for the presence of pareidolia , not anthropic markings on stones . Tiompan has a valid point. As much as you bandy his name about, not once has Jack Hranicky made any public statement that he supports your claims.